Using the Controller API requires no additional build system setup. The functionality is present in common.aar and libgvr.so, which are already being linked with your app. Important: the code assumes you will be using Android NDK rev 10e. We have not tested this code using other versions of the NDK. If you are using another version of the NDK and notice compilation or linking problems, try switching to NDK rev 10e. The main entrypoint for the controller API is the ControllerApi class. // the GvrLayout. Do not destroy it. // Initialize default options for the controller API. // by default). Touch, buttons and orientation are on by default. // Create the ControllerApi and ControllerState objects. // Initialize it. Notice that we pass the gvr_context pointer. // this each frame to get the current controller state. // the controller API now (if not, wait until you get onResume()). Note: Passing a gvr_context* to the controller API, although recommended, is not strictly required. You can pass NULL instead, and the effect will be that performing the recenter gesture in the controller will NOT automatically recenter the headset. In that case, you will have to recenter the headset yourself when the controller is recentered. // Read controller state, equivalent to gvr_controller_state_update(). //    (X points to the right, Y points up, Z points back). The transient event flags (GetTouchDown(), GetTouchUp(), GetButtonDown(), GetButtonUp(), GetRecentered(), etc) are called transient because they will be true for only one call of Update() after the event happens, then will revert back to false the next time you call Update(). Thus, when they are true, they mean that the corresponding event happened since you last called Update(). The coordinate space for orientation, gyro and accelerometer are now standardized and is now consistent across the headset and the controller. The headset poses and the orientation of the controller are reported in what is called Start Space. 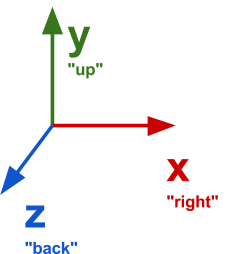 Start Space is right-handed, so when a viewer is positioned on the positive side of the Z axis and looking at the origin, they will see that the Y axis is 90 degrees counter-clockwise from the X axis (illustrated below). The Y axis points upwards (against gravity). The X and Z axes lie on the ground plane. Relative to the controller's pose when tracking starts, the X axis points to the right, and the Z axis points back. The axes do NOT move with the controller. They remain fixed. (1) All poses are given relative to the initial pose; they are not cumulative operations. (2) [X, Y, Z] is the vector component, W is the scalar component. Note that (X, Y, Z, W) expresses the same rotation as (-X, -Y, -Z, -W). The accelerometer and gyroscope are reported in Controller Space, which is a coordinate system that moves with the controller. In other words, the axis are defined relative to the body of the controller and they move as the controller moves. Controller Space has the axes arranged in the same way as Start Space, but the coordinate system moves with the controller. The X axis always points to the right of the controller. The Y axis always points perpendicularly from the top surface of the controller. 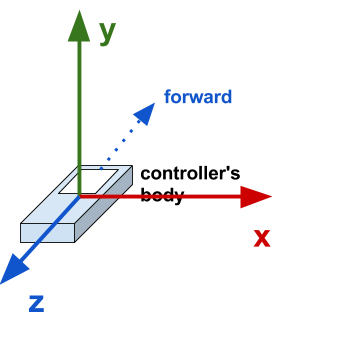 The Z axis always points along the controller's body, opposite to the controller's "forward" direction. Press the HOME button (don't release it yet). Point straight ahead, with the controller level with the horizon. Continue to hold HOME for at least 1 second, then release it. When the user recenters the controller, the API will start reporting head poses and controller poses relative to the new center. You will know that a recenter has happened because the state.GetRecentered() value will be true for one frame. Recentering only affects the controller and headset's heading (yaw) not the pitch or roll. The pitch and roll are always defined by gravity. Note: if you passed NULL as the gvr_context* pointer when initializing the Controller API, the headset will NOT be recentered automatically with the controller. In that case, you may want to manually recenter the headset when state.GetRecentered() is true. On every frame, you should check state.GetApiStatus() and state.GetConnectionState(). They tell you about the health of the connection to the controller. If gvr::ControllerApiStatus is anything other than gvr::kControllerApiOk, something is permanently wrong with the client and requires user action to fix. HOME - reserved for launching system UIs and recentering. VOLUME UP/DOWN - fixed functionality, implemented by system.